The Federation's Center for Holocaust Awareness and Information (CHAI) works to ensure that the Holocaust and its lessons are not forgotten. 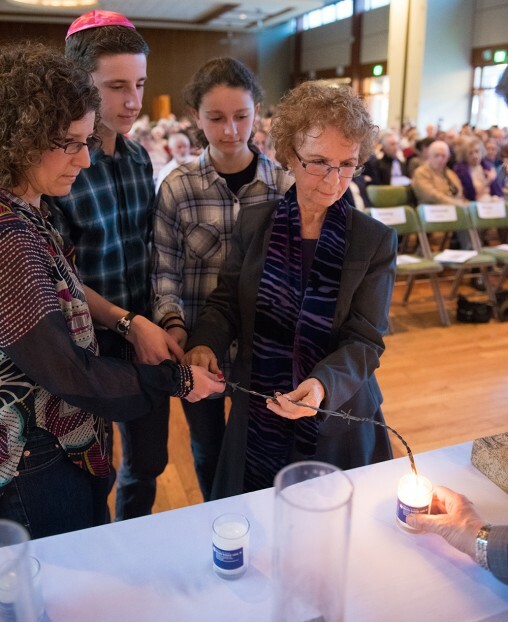 Its acronym, CHAI, meaning "life" in Hebrew, reflects the mission of The Center, to keep alive the memory of the Holocaust through the life stories of local survivors and their families. The Center is located on site at the Jewish Federation and can be reached by phone at 585.461.0490. Through our award winning "Survivors in the Classroom" program, these important witnesses address thousands of students yearly, ranging from 6th graders through college students. Books, videos and archival materials based on survivors' experiences are also available. New York State has mandated the teaching of the Holocaust; the Center trains teachers and provides them with the necessary resources to do that job effectively. CHAI helps lead the teen Journey for Identity from Rochester to Poland and Israel. Our archive of local Holocaust survivor testimony is a powerful record of Holocaust experiences and an invaluable tool for educators.